History of Jerome Township. Union County, Ohio . by W.L. Curry. Press of Edward T. Miller Co. Columbus. Ohio. 1913. Contains a history of the 88th OVI on pgs 120-121. Bird's Eye View of Camp Chase Near Columbus, Ohio . Drawn by A. Ruger. Created & Published by Ehrgott, Forbriger & Co. Cincinnati. Ohio. 186? Includes 88 Rgt. O.V.I. American Memory from the Library of Congress. Library of Congress Geography and Map Division Washington, D.C. Organized in July, 1862, and mustered in October 27, 1862, under Colonel George W. Neff, it was placed on duty at Camp Chase, Columbus, Ohio. When Kirby Smith threatened Cincinnati the 88th moved to Covington; but soon returned to Camp Chase. A detachment served in West Virginia and Maryland, but returned to operate against John Morgan. In October, 1863, the Regiment was ordered on duty in Cincinnati, but again returned to Camp Chase, where it remained until mustered out July 3, 1865. This was a complete and well drilled organization and if given a chance would have done good service in the field. 88th Regiment Infantry. "lst Battalion Governor's Guard." Organized at Camp Chase, Ohio, and mustered in October 27, 1862. 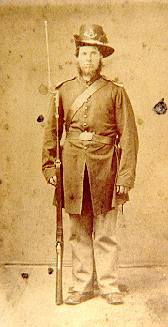 Duty at Camp Chase till October, 1863, and at Cincinnati till December 20, 1863. Duty at Camp Chase till July, 1865. Mustered out July 3, 1865. Lost by disease 80 men.